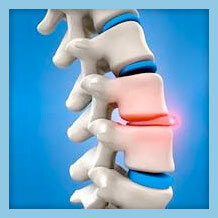 Back pain is a broad term used to describe pain along the lumbar spine. The characteristics of back pain can vary widley, and the pain can be attributed to anything from brusing to more serious spinal conditions like disc tears or degenerative disc disease. What Does My Back Pain Mean? Depending on how your pain presents, what your medical history is, and several other factors, your pain can be attributed to a wide range of possible conditions and causes. In addition, the presence of symptoms such as tingling, numbness, or loss of bladder control may indicate a more serious spinal condition. Recent physical trauma can prove to be the source of your pain, or it may affect and intensify a pre-existing condition. Do you have back pain and think you may be suffering from a spinal condition? We have a quick and easy tool to help gather some information from you to help us determine what your problem is and get you on the road to recovery. Before determining treatment for your back pain, it’s cause must be determined. Once you have been diagnosed, you can then work with your doctor to design a treatment plan. Common treatment options include medication, physical therapy, injections, minimally-invasive surgery and more. The real question is: What treatment is best to treat your back pain? Use our Treatment Match tool to quickly get started in finding the right treatment for you.